Data centers and their administrators are responsible for the thousands of storage drives at risk in a power loss event, and whether the last operation prior to the power outage was completed. One of the newest technologies embedded in a solid-state storage device is Power Loss Imminent (PLI) technology. 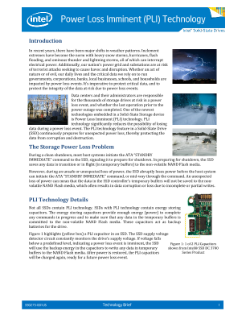 PLI technology significantly reduces the ...possibility of losing data during a power loss event. The PLI technology feature in a solid-state drive (SSD) continuously prepares for unexpected power loss, thereby protecting the data from corruption and destruction. Read the full Power Loss Imminent Technology Brief.